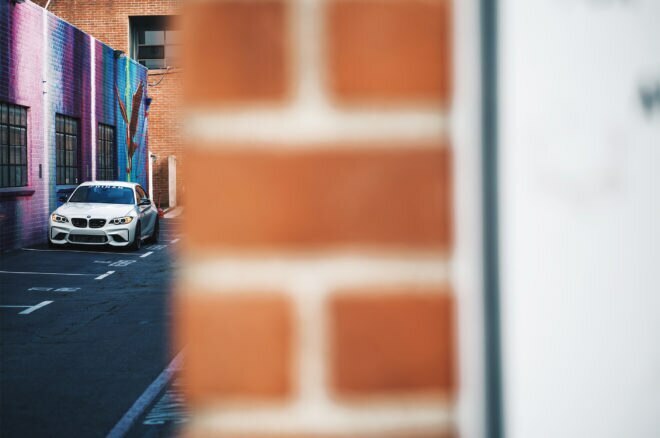 LA CAÑADA FLINTRIDGE, California — Customization and personalization of products is more common than ever, but it is nothing new to Dinan Engineering. 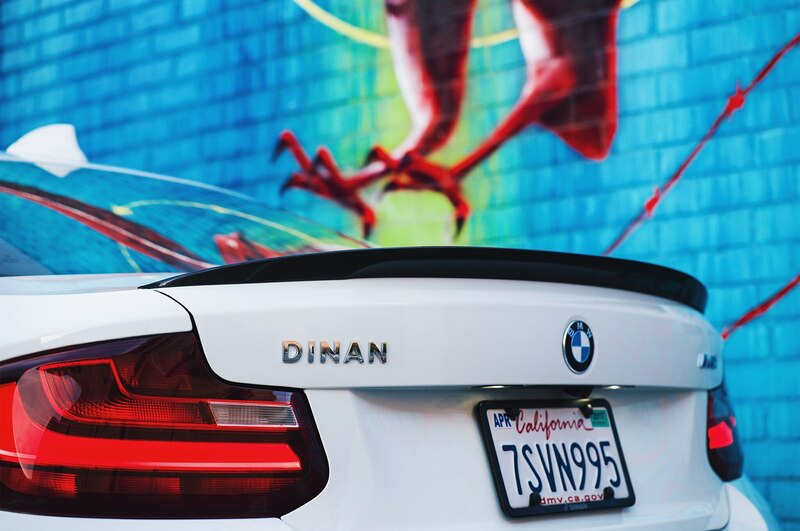 The Morgan Hill, California firm has for years applied the practice to BMW’s products, allowing customers to pick and choose their perfect parts combination—as is readily apparent with its 2017 Dinan Engineering S2. 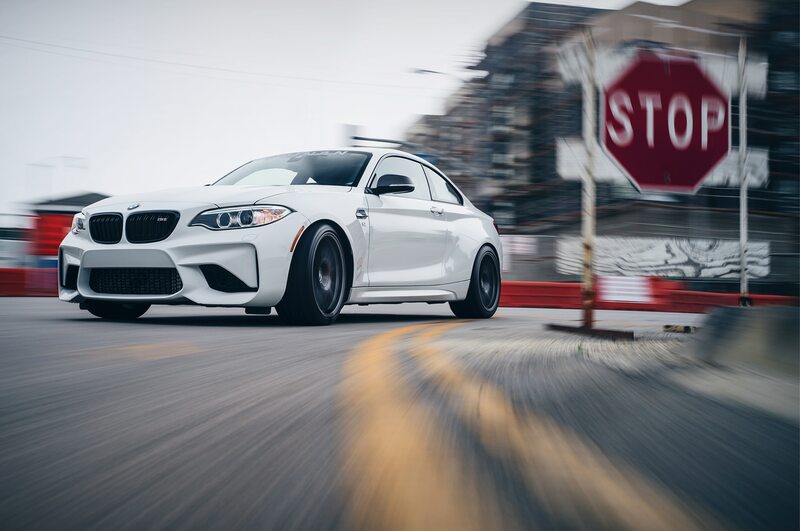 Based on the 2017 BMW M2 — BMW’s hottest new performance car and one of our 2017 All-Stars — the S2 ramps up the performance thanks to the company’s Stage 4 package. 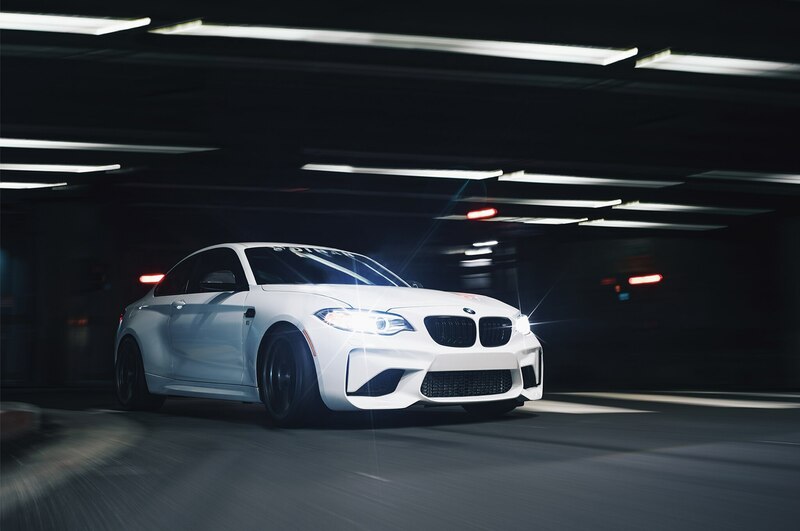 From the factory, the M2 develops 365 horsepower and 343 lb-ft of torque — though Dinan measured 360 horsepower and 404 lb-ft when it put the car on a dyno. 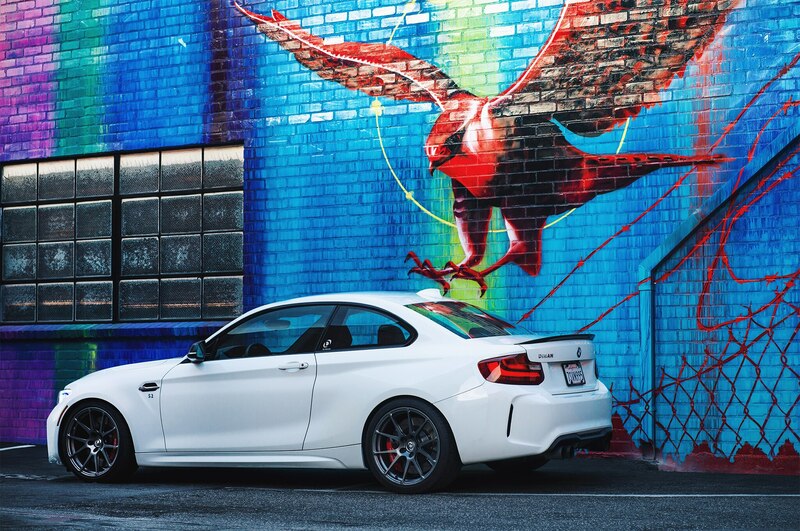 After the Stage 4 package, Dinan’s S2 makes 446 hp and 458 lb-ft of torque. The improved numbers are due to a host of upgrades starting with the company’s proprietary DINANTRONICS Performance Tuner. The ECU flash adjusts the car’s software and enhances the engine’s response and power but retains the stock engine’s emissions legality. The DPT is the backbone for the rest of the car’s modifications. 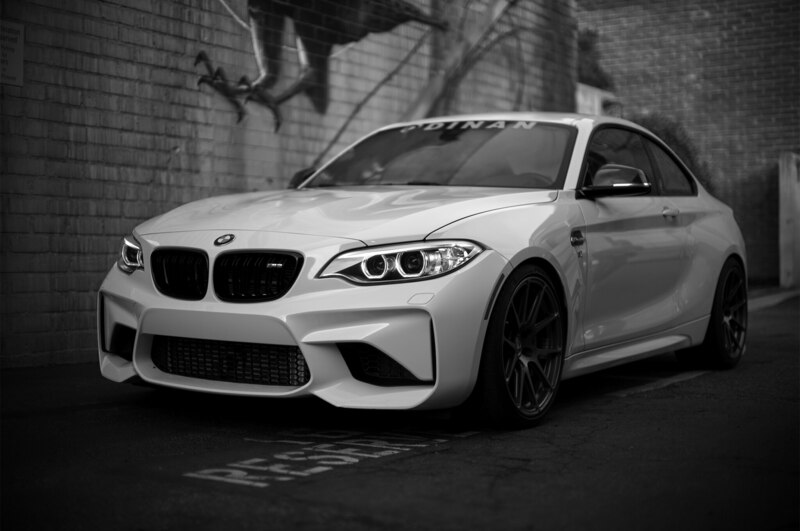 To get 81 more horsepower and around an additional 115 lb-ft of torque, Dinan Engineering fit the M2 with a bigger turbo-compressor wheel, allowing for 30-percent more flow through the turbo system. However, when adding this much power, cooling is vital to the engine’s survival. Dinan fit the M2 with a new dual-core intercooler that increases the intercooler’s surface area by 278 percent. Dinan states that this reduces the chances of heat soak to nearly zero. Further performance additions include a carbon-fiber cold-air intake, a free-flow exhaust with ceramic black exhaust tips, and removal of the car’s resonator. In terms of handling, Dinan installed the company’s rear suspension-link kit which replaces the factory’s rubber bushings with Teflon-coated machined steel and a straight billet-aluminum rod. Everything, according to the company, is adjustable to make sure the customer can dial in the car perfectly. Dinan also included its tension-strut ball-joint kit, adjustable camber plates, lightweight tubular sway bar for both front and rear, and the company’s high-performance adjustable coil-over suspension. 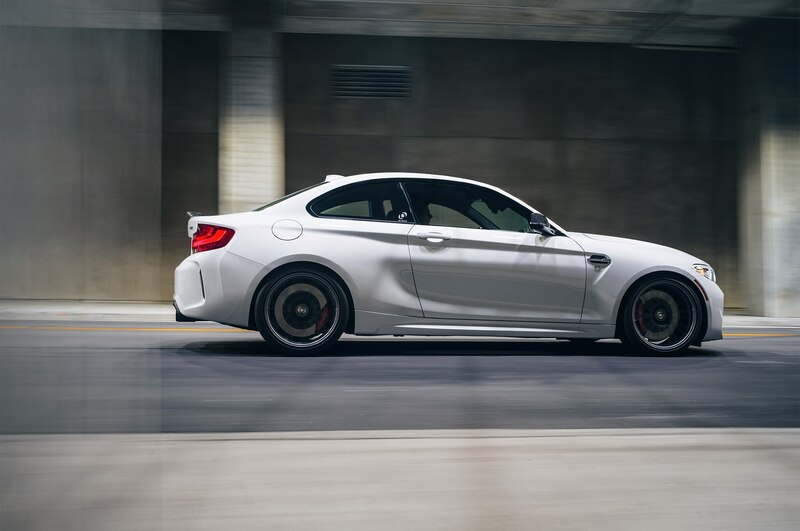 The S2 also features Brembo brakes both front and rear ensuring it stops brilliantly, especially on the slippery, foggy canyon roads of the San Gabriel Mountains. The S2’s sharp yowl cuts through the dense fog, sound waves bouncing off the canyon’s granite walls. 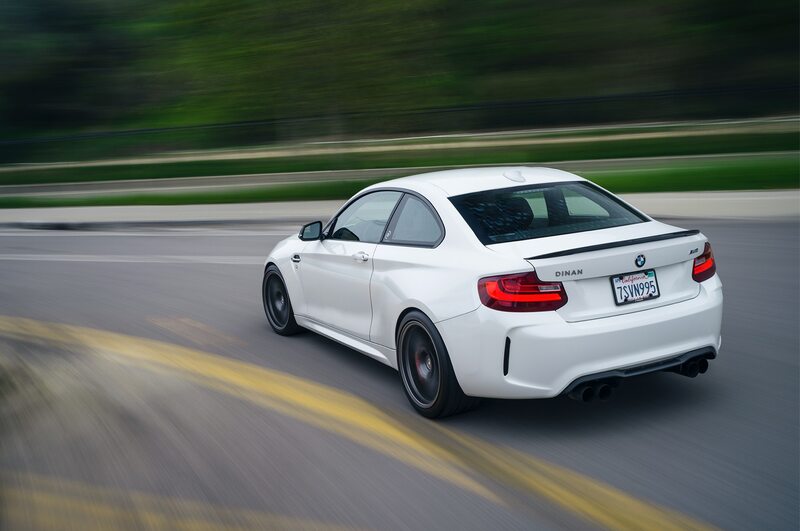 The new exhaust not only helps the car breathe better and develop more power, but the M2’s tenor is changed drastically. Gone is the loud blat common to modern BMWs; in its place is a more subtle, inline-six howl. Although improved, it could be bettered if BMW (or Dinan) allowed the car to rev higher as old BMWs were happy to do. Today, grip is a precious commodity. Yet, as middling rain pelts the S2’s windshield, the optional track-grade Pirelli P-Zero Corsa tires and upgraded suspension translate the road back to my fingertips, giving me an experience that doesn’t feel out of control or in danger of careening off a cliff. Grip builds and fades, and each time it does so the wheel relays tiny vibrations. When you don’t want or need grip, a heavy right foot will get the compact S2 to slide like there’s no tomorrow. Pick a corner, any corner, and the S2’s 446 hp and 458 lb-ft easily render its tires impotent. With traction control turned on in the wet conditions high above the canyon’s floor, I figure it should probably remain on for the entirety of my romp. But for those wanting to become the new drift king, know that the S2 will do long, smoky drifts in the confines of a closed course with ease. Just remember the Pirellis are $400 a pop. I duck onto a faster, dryer portion of Angeles Crest Highway and finally dive deeper into the S2’s powerband. Below 3,500 rpm, I note the turbocharger modifications, a slightly sluggish character reminiscent of an old big turbo Toyota Supra. But when boost kicks in and the impeller spins at a couple-hundred-thousand rpms, look out. At higher rpms, power is delivered in big, heaping handfuls and doesn’t let up until you chicken out and lift. 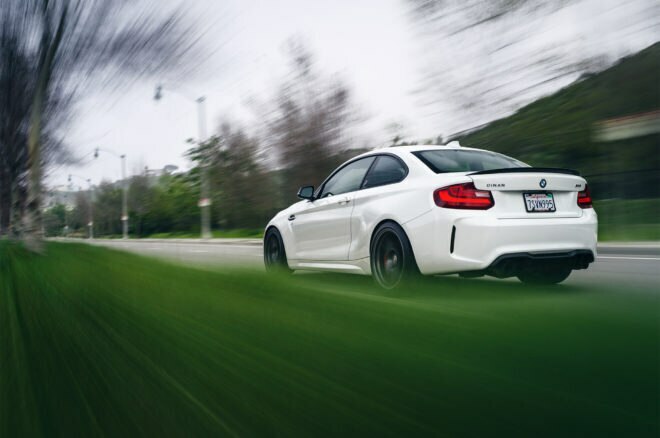 Reeling the power back to sane levels, a stab of at the left pedal has Dinan’s own Brembo big-brake kit stopping the light car in a hurry, righting my internal organs after the power onslaught sent them toward my spine. But it isn’t an on/off switch. There’s progression, allowing me to dial in exactly how much braking force I want. Approaching a sharp bend, I can stand on the brakes as I dive deep into the turn, letting off and trail-braking the rest of the way through. These brakes give you confidence rarely found in cars with five-times the price tag. Yet, while the Dinan S2 is a remarkable performer, capable of slaying back-country canyon roads, racetracks, and flat stretches of nothing, the performance improvements carry a price separate from dollars and cents. 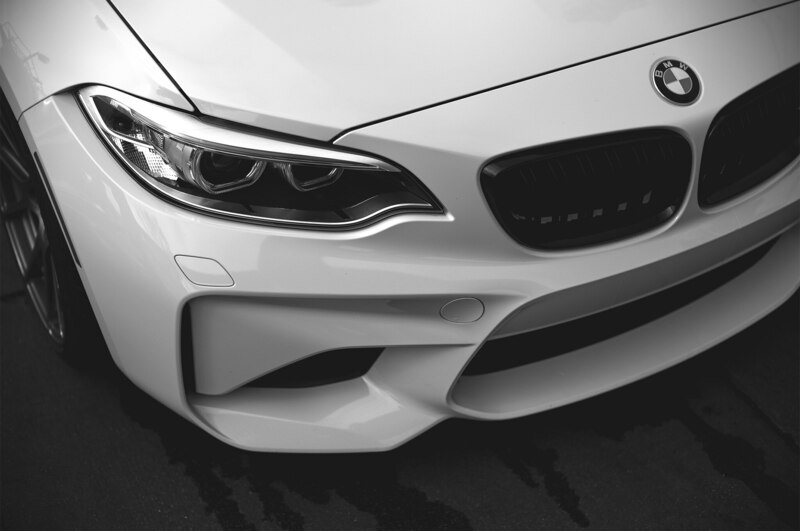 The S2 kit with every box ticked, as this car is optioned, is stiff, jarring, and loud, making it a poor daily driver — a selling point of the standard M2. While no sound-deadening has been removed, the optional resonator delete, in conjunction with the ultra-stiff race-spec suspension and the Pirellis’ paper-thin sidewalls, fills the cockpit with high levels of road and engine noise. This wouldn’t matter in a point-to-point race or to a weekend warrior who only attacks canyons and racetracks, but it’s tedious for anything longer than an hour or two just pootling along the highway. The good news is, of course, customers don’t have to settle on a single, dogmatic kit; every part Dinan offers can be had à la carte. Just want the ECU flash? That sets you back $1,801. How about an exhaust? $1,849. Coil-overs, toe links, intercooler, cold air intake — take what you like. At $28,358 for Dinan’s full S2 package including a set of lightweight forged wheels, the stickier Pirelli rubber, and Dinan’s Brembo big-brake kit, this car is within spitting distance of a ton of hugely competent performers, including its big brother M3/M4, the Mercedes-AMG C63 S, Porsche’s 718 Cayman S and even its base 911 Carrera. And that’s not including plenty of other performance cars that offer similar driving experiences for less money: the Ford Shelby GT350R and Chevrolet Camaro ZL1 come to mind. They also offer quieter, more refined cabins, and that should give prospective drivers pause. Still, for BMW aficionados, the Dinan S2 has the ability to send shivers down your spine while making easy work of the road ahead.